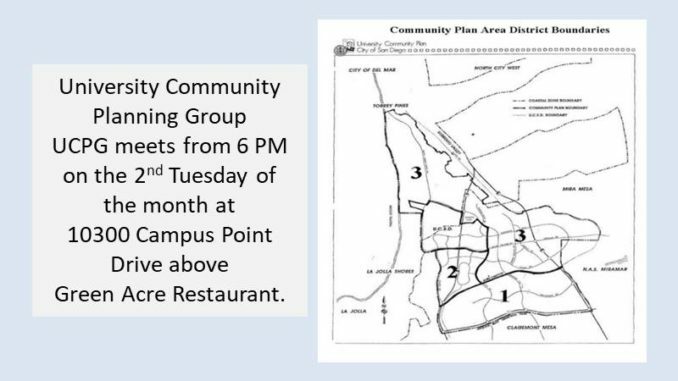 University Community Planning Group (UCPG) will meet on Tuesday, September 11 at 6 PM at Green Acre Campus Point, 10300 Campus Pointe Drive, 2nd Floor, San Diego, CA 92121. Large parking lot, no charge. All are welcome. Agenda topics include information and/or action on the Pure Water Project Working Group Meetings; SANDAG Mid-Coast Trolley construction; Verizon Wireless Scripps Green, Project No. 590724; utility easement “The Collection at UTC, Seritage”; and information about the UC Community Plan Update process.